Odoo Implementation is the service of implementing the Odoo Complete ERP Suite with Odoo Enterprise or Community Suites. Targeting companies of all sizes, the application suite includes Odoo modules and Odoo Apps Such as Sales, Purchase, Manufacturing, Accounting, Project, CRM, HR etc. Odoo which is formerly known as OpenERP simplifies the data management system by integrating all the essential information under one resource. It helps in reaching the conclusion quickly with all the statistics available on a single click. 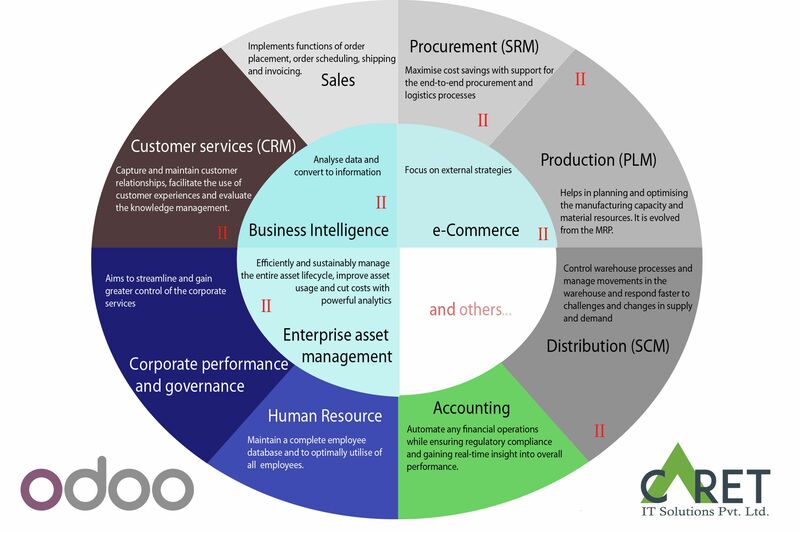 There are two different approaches used for the Odoo ERP implementation. The first is an implementing mode that is low cost, generic, with few developments to be done. This approach goes from Odoo generic to customer’s needs. The Second is used when the client’s business is weakly covered by Odoo generic. This approach goes from customer’s needs analysis to Odoo solution. Odoo ERP can be implemented fast and quickly as it comes up with many modules that can be used according to the business requirements. Odoo implementation Services in any company plays an important role in company transformation to implement. Odoo requires a lot of technical skills and a right implementation method. It not only saves your time but also the money. Available both on cloud and site, Odoo is having more than 3000 modules that can be utilized according to the business specifications. As Odoo is an open source software, it can be tailored in many ways to meet the need of any business. It can also be integrated with other apps with the help of various API libraries and web services. Being an Odoo Implementation Company, we provide all the solutions regarding the Odoo Implementation. Caret IT offers end-to-end implementation and works essentially to get the best result out of the Odoo implementation. We study and analyze your necessities and modify Odoo in order to fulfill them.